You can eat at one of the best restaurants in Las Vegas, or you can do what a lot of tourists feel obligated to do: check out a buffet. Thankfully, the days of the classic, cheap version are long gone. Today's buffets are proving it's not a choice between quantity and quality anymore. Instead, they're offering some global fare and fine-dining all-you-can-eat experiences (which is just as weird to type as it is to read). 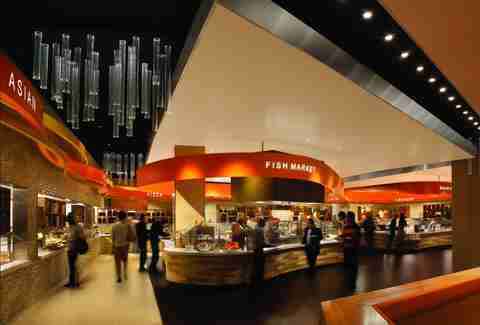 So please, if you're going to hit up a buffet in Sin City, make sure it's one of these. But do leave plenty of room in your belly before paying them a visit. Seriously, it's still a buffet. 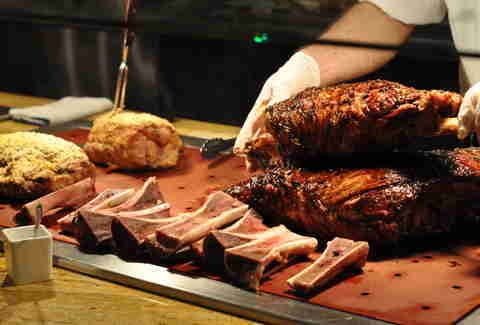 Generally the standard against which all Las Vegas buffets are judged, Bacchanal Buffet offers more than 500 dishes made fresh from a team of 15 chefs each day. (That's a lot of food!) 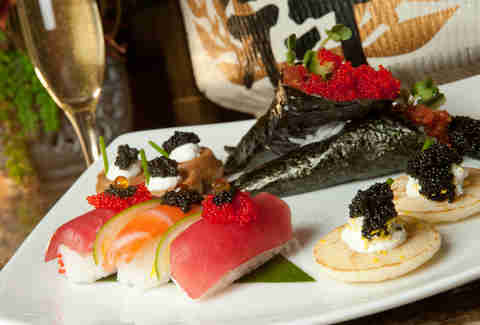 It's served in nine open interactive kitchens with add-ons that range from poached lobster to Sasanian Imperial caviar. If you want an entire fish grilled to order, go for it and don't hold back; Bacchanal Buffet is all about volume, not just in food, but also in service, averaging about a million guests each year. A Vegas buffet used to be about slopping as much food as possible on your plate, but Wicked Spoon helped turn that concept around when it opened in 2010, offering a wider variety of food in smaller portions with the same quality you'd find in a nice restaurant. The idea is to sample a little bit at a time and leave with a more rewarding experience. It also doesn't hurt that an in-house team of butchers is responsible for some of the most mouthwatering meatballs, prime rib, and bone marrow on the Strip. 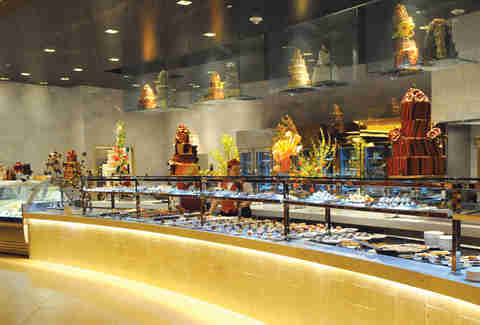 The overall approach has possibly made Wicked Spoon the most influential buffet in Las Vegas. Modeled after a small French village with a town square and country homes, this buffet combines traditional favorites with made-to-order stations that represent the five provinces of France. For example, quiche Lorraine with steamed mussels and clams represents Normandy, while prime rib, turkey, and leek mashed potatoes offer a tip of the hat to Burgundy. At the center of it all, you'll find a cozy dessert display with (of course) French crepes, crème brûlée, and a macaroon tower. For those who prefer to skip lines, Le Village Buffet is the only buffet in Vegas that accepts online reservations through OpenTable. 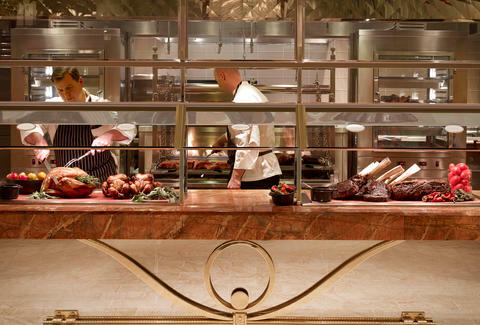 More than 4,000 guests a day stop in for a diverse selection of globally inspired cuisines, often with a fine dining touch, at The Bellagio's Buffet. 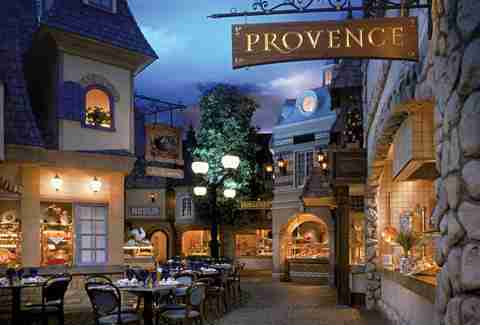 It offers a gourmet caviar station, with an added Champagne brunch on the weekends, and is unlike any other buffet on the Strip, offering a "Chef's Table" dining experience with custom services that include tableside carving of rotisserie oven meats and specialty desserts. It's available for large parties (eight to 18 guests) from 4-10pm. This open and comfortable buffet features eight live-action stations, including an authentic tandoor oven that bakes naan bread on the spot to complement a juicy selection of Indian-style kabobs. The crab legs, paella, and deep selection of desserts (grab a blondie!) are among the other favorites. Wash it all down with bottomless wine, mimosas, Bloody Marys, and premium beer. Just remember to pause between sips. 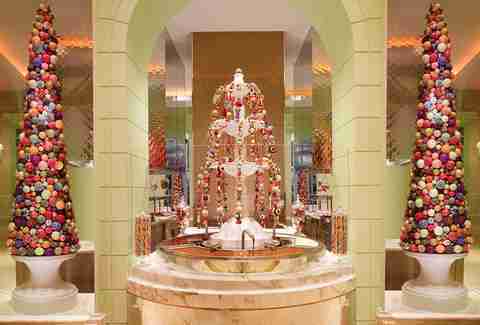 Wynn recently revamped its buffet with more than a hundred new items, adding cool stuff like Peking duck, street tacos, an upgraded rotisserie meat selection, and an expanded dessert spread (which feels like a buffet all by itself, with a large chocolate fountain at the center). You'll also come across spaghetti made from Frank Sinatra's legit family recipe and the only Woodstone parrilla grill on the Strip, perfect for rodizio-style South American barbecue. 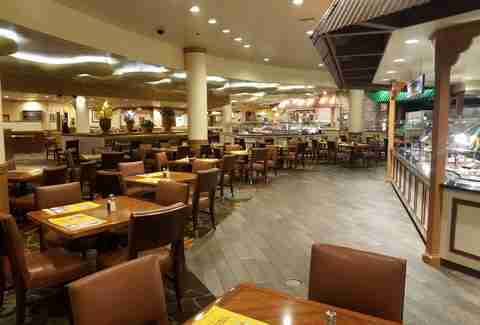 A staple at Station Casinos properties, the Feast Buffet is popular with locals and your best bet for avoiding a steady crowd of indecisive tourists while enjoying buffet prices far lower than what you'll generally find on the Strip. The versions at Texas Station and Boulder Station have recently revamped the Mexican food selections, providing more authentic options worthy of your attention. 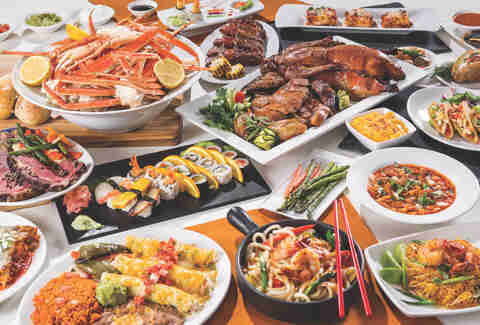 This buffet is looooong, with 13 stations representing different regions around the world, including live teppanyaki and Asian barbecue as well as obvious options like pizza, sushi, and omelets. It all adds up to about 300 items with about 70 seafood dishes, including lobster (which can be added for an extra $15). There's also a full-service bar with a mean Bloody Mary that measures up to the best in Las Vegas. A favorite for both locals and out-of-towners thanks to the inclusion of all-you-can-drink beer and wine in the price, the best buffet in Henderson also offers a seafood brunch on the weekends that comes with bottomless sparkling wine. If you prefer a little more caffeine, order a boozy coffee drink instead. Studio B recently introduced a prime rib brunch on Fridays (11am-2pm) that's definitely worth missing an hour or two of work to check out. 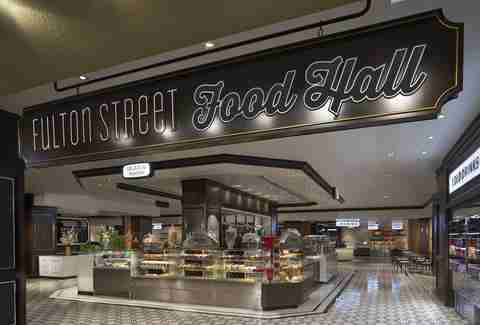 While technically not a buffet, the Fulton Street Food Hall offers a similar everything-in-one-spot dining experience, but with each item individually priced -- from fresh-baked pastries and New York-style pizza, to sandwiches with eight choices of bread. 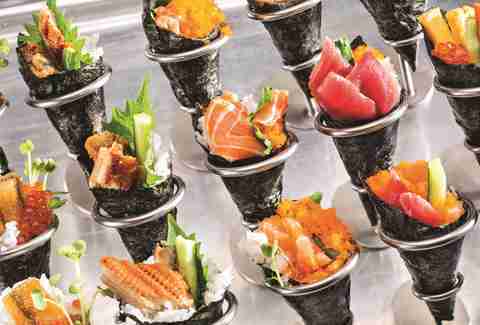 The global fare ranges from fresh sushi to 10 different Pan-Asian noodle or soup stations. A Mexican food station was recently added that offers tacos, burritos, and a south-of-the-border twist on French crepes. There's also a sit-down breakfast served from 6-11am each day, highlighted by a tasty cinnamon roll breakfast sandwich and the decadent bourbon bacon cakes (where applewood smoked bacon is dipped in buttermilk batter and topped with vanilla bourbon maple syrup). Rob Kachelriess has been writing for Thrillist for nearly three years and is a news producer for KVVU FOX5 in Las Vegas. He knows some things about buffets that you probably don't. Follow him on Twitter @rkachelriess.